As Vietnam’s former imperial capital, Hue occupied a special place in the hearts of the Vietnamese people. Over decades of conflict, it had been spared the terrible effects of war. But that all changed on January 31, 1968, the eve of Tet—the lunar new year, Vietnam’s most important national holiday Tet had previously been marked by a mutual ceasefire, but this time the celebrations and hopes for a happy new year were shattered. All of South Vietnam erupted in a cataclysm of violence as the North Vietnamese Army and the Viet Cong launched a massive military and political offensive. The American embassy in Saigon came under siege and Vietnam’s ancient capital city was captured nearly in its entirety. The only forces immediately available to counterattack into Hue were two Marine infantry companies based ten miles south of the city. For the next four weeks, as the world looked on, fewer than two thousand U.S. Marines fought street by street and building by building, with virtually no air support, to retake the symbols of Hue’s political and cultural importance. It was savage work. Ground gained was often measured in yards, with every alley, street corner, window, and garden adding to the butcher’s bill. In the end, the Marines retook the city, but scores of Americans and thousands of Vietnamese civilians died there. This pictorial is a testament to their will and their sacrifice. The Vietnam War is often pictured as a jungle conflict, punctuated by American troops fighting in rural hut-filled villages. But in the 1968 Tet Offensive, the war spilled out of the jungle into the streets of Hue City. The battle for Hue became one of the most important of the war, a month of grueling house-to-house fighting through buildings and around civilians. 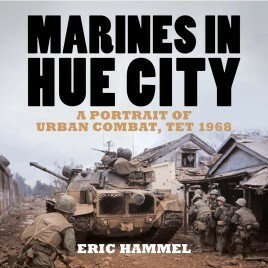 Marines In Hue City documents the intense urban combat in Hue with many never-before-published photographs, including more than one hundred in full color.